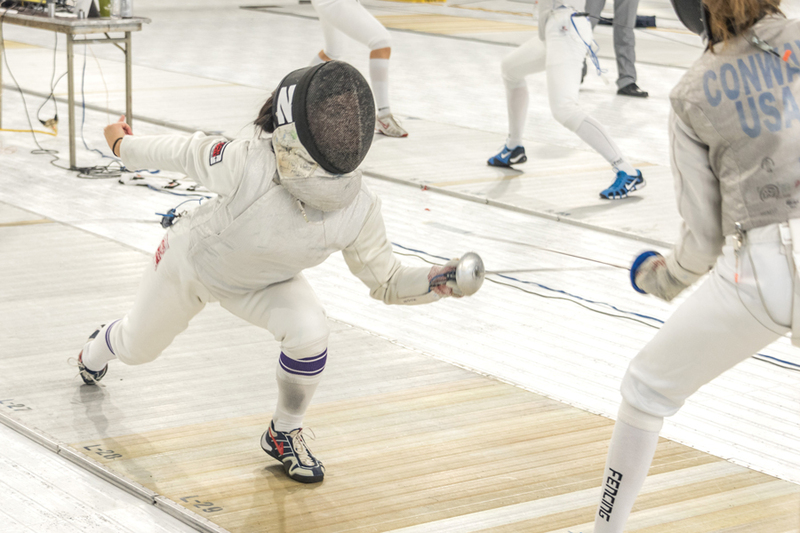 A Northwestern fencer attacks their opponent. The Wildcats left New York with a 8-0 record this weekend. When Northwestern makes its annual trek out to Poughkeepsie, New York— a town two hours north of New York City and on the Hudson River — the Wildcats do not expect to drop a match. NU left the Vassar Invitational with that goal reached, finishing the one-day tournament with a perfect 8-0 record. The Cats have attended the Vassar Invitational the last four years and have lost only once. That came in 2015 against Cornell as NU lost the match 14-13. Since then, the Cats have now won 25 straight matches in Dutchess County. The closest match of the day was against Stevens Tech. While foil stridded to an 8-1 finish and epee went 6-3 in their nine bounds, sabre slumped to 2-7 against Ducks. It was easily the worst record of any of the three weapons against one opponent on the day. But the squad bounced back to a 7-2 record against Lafayette the next round. The other struggle came for epee against the Leopards. The epee team went 4-5 against Lafayette but recovered to finish the day with a 9-0 final round. NU bookended its day with two dominant victories. To start the day, the Cats defeated the City College of New York, 26-1, and then finished the day with a 26-1 victory over another New York City school, Wagner. The foil squad dropped the fewest amount of bouts during the day with only three losses. Freshman Alyssa Chen, Jerrica Liao and Dhruthi Reddy, and sophomore Sofia Simontov all finished zero losses. Simontov also finished with the third-most wins on the team with 12. Freshman epee Emma Scala finished with a team-best 14 individual wins with fellow epee partner and freshman Natalie Kim having the second-most wins with 13. Of the 18 fencers who competed at the invitational, 17 of the fencers were underclassmen with the majority of the participants being freshman. This is because the Vassar Invitational features weaker opponents than the Cats will usually see, which allows NU’s inexperienced fencers to gain experience in a competitive collegiate setting. “For us, we have 12 first-years on the team and we had 11 of them fencing there because it is a great opportunity to get exposure to college format which is so radically different than anything they are used to,” Moss said.